Who’s stayed there? Queen Elizabeth II and H.R.H. Prince Philip, Duke of Edinburgh, Woody Allen, George Clooney, President George H. W. Bush, United States, Bill Gates, President Vladimir Putin, Russia, Francis Ford Coppola and more. What makes it special? 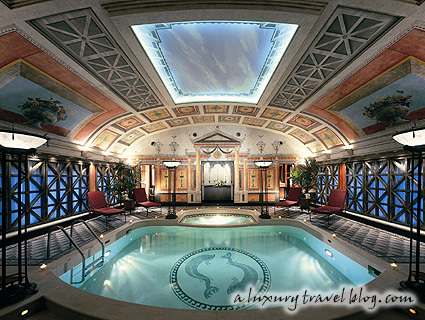 Its private spa in Pompeii-style: an area of 100 square metres with frescoed walls and vaulted ceiling encompassing a swimming pool, whirlpool, sauna and Turkish bath. 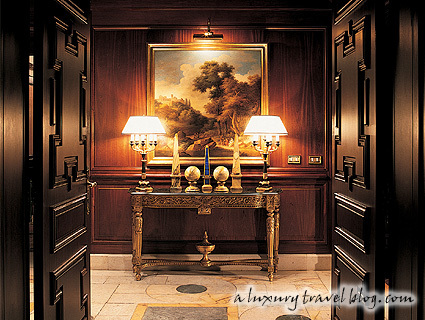 With its own private elevator on the panoramic 10th floor of the Hotel Principe di Savoia the 500 square metres (almost 5,400 square feet) Presidential Suite is one of the largest of its kind in the world. 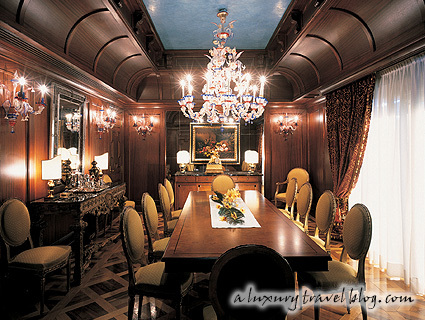 It is also one of the most luxurious. Its three bedrooms include the sumptuous Presidential Room, featuring Empire and original antique furniture and an elegant working fireplace, while another bedroom is equipped with closed-circuit TV monitors for bodyguard surveillance of common areas. The large and elegant dining room is served by a completely furnished kitchen including French crystal, Limoges porcelain and silverware. 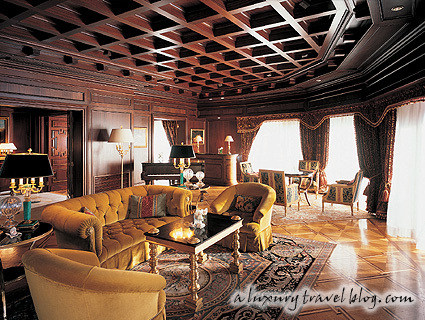 The living room features mahogany lacunar ceiling and wall panelling, inlaid wooden floors, fireplace, library, piano and hi-fi that diffuse music throughout the apartment. The room is brightened by large windows that open onto a terrace overlooking the roofs of Milan. In addition, the Presidential Suite features a private spa in Pompeii style, an area of 100 square metres with frescoed walls and vaulted ceiling compassing a swimming pool (20 square metres), whirlpool, sauna and Turkish bath. The mosaic pool and polychromatic marble floor draw inspiration from ancient Roman baths. Large torch holders in wrought iron and blown glass ensure evocative lighting in keeping with the room’s characteristics. The suite’s interior design includes Empire style furniture, authentic Venetian XIX century mirrors, Murano glass lamps and chandeliers, marble and bronze wall lamps, original late XIX century prints and fine objects in marble and granite.